If you are interested in private yoga in San Francisco or would like more information about retreats, Contact Rosemary or reach her locally by phone at (415) 723-9700. 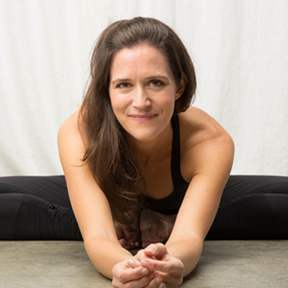 In addition to teaching studio and private yoga classes, Rosemary provides onsite corporate yoga in San Francisco & Los Angeles to a number of local businesses, including RPX Corporation, The Barbarian Group, JGE Capital Management and others. Corporate yoga classes can range in size from five to fifty students, depending on the space available at your organization’s location, and sessions are designed to cover all levels of yoga to meet your group’s needs. Businesses generally average between one to two yoga sessions per week, during the morning before the workday swings into high gear or after the workday is over. As many private yoga students have discovered, yoga before work can be a great start to the corporate day – and having a yoga class scheduled for day’s end can be a great way to unwind the seated mind before tackling the commute home. Rosemary also offers conference yoga and wellness sessions at corporate events individually, and partners with Alchemist Wellness for larger conferences and to accommodate schedule conflicts. She recently led the wellness session at the 2012 Association of American Medical Colleges Annual Meeting in San Francisco. t: 415.723.9700 ©2016 Rosemary Garrison Yoga All Rights Reserved.